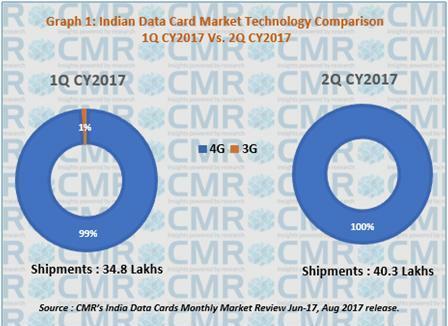 The shipment of Indian Data cards market grew to 4 million (16%) over 3.4 million in 1Q CY2017. The market witnessed 614% growth from 2Q CY2016 to 2Q CY2017 according to CMR’s India Data Cards Monthly Market Review released earlier today. The report reveals that Reliance Jio has transformed the data card market in India. Reliance Retail’s JioFi that is procured from multiple OEMs accounts for 91% of market share, whereas Huawei only at 3% in the Data Card segment, 2Q CY2017. Further, LTE/4G data cards affirmed its top position with 17% sequential growth, 2Q CY2017 in case of units shipped. The launch of consecutive free data services followed by availability of Mi-Fi data cards at different prices along with aided the consistent growth of Reliance Jio with 91% during the same time period, says CMR India. When it comes to 3G data cards, they showed a decline of 61% in 2Q CY2017 as compared to 1Q CY2017. The LTE/4G based Mi-Fi devices market share stood at 97% at the end of 2Q CY2017. The other vendors’ market shares are stagnant by 3% from the last two quarters. The units shipped of Alcatel witnessed the fastest growth of 522% in 2Q CY2017, whereas ZTE and D-Link shipments registered a decline of 21% in case of former and 82% in case of latter respectively. Among Reliance Jio offered MiFi devices, M2S continued to be country’s fastest selling model. JMR1140 stood second while JioFi ranked third. It is revealed that Mi-Fi’s primarily driven by Jio are gaining acceptance in Tier II and Tier III cities and towns that could result in erosion of the potential broadband base for operators like BSNL. In such towns and cities, users benchmark broadband speed and quality with that of BSNL fixed line broadband, which in the majority of the circles for popular plans is 2 Mbps for residential users. Mi-Fi could also slow the pace of 3G to 4G Smartphone replacement as the market looks for replacement opportunity in smaller towns and cities. 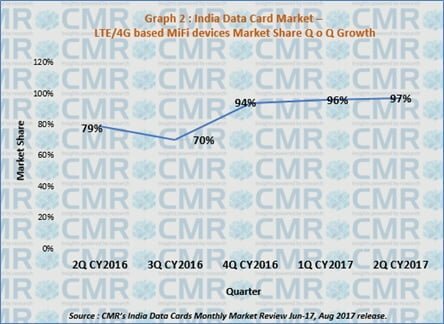 “LTE/4G data card shipments account for 17% sequential growth owing to Mi-Fi devices and has proved to be the most favoured technology in the same time period. 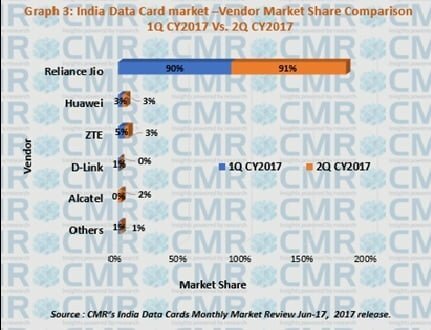 On the other hand, 3G data card shipments shrunk by 61% in 2Q CY2017 as compared to the first half of CY2017” stated Shipra Sinha Analyst, Industry Intelligence Practice at CMR. The data cards offering a data rate of 150 Mbps accounted for 97% of the total market of overall shipments in 2Q CY2017. Around 92% of Data Cards were on Qualcomm Chipsets during the period. Jiofi is a big boon to rural last mile connectivity. BSNL was the only option in my remote village, whose services used to go down every time there was a power outage at the exchange. With jiofi, we are connected 24X7 to the internet on our estate. 1GB per day is more than enough for Jiofi. With BSNL I could hardly get to the internet and use my plan.